Launched two years ago, John Deere FarmSight consists of three key elements: John Deere machinery, intelligent AMS precision farming technology and innovative dealer services. Delivered through the dealer network, John Deere FarmSight Services can produce tangible results and provide customer value by increasing machine uptime and reducing operating costs. 1. Many John Deere machines are delivered ex-factory equipped with ISOBUS, GreenStar precision farming components or AutoTrac ready, so that guidance, documentation and yield mapping as well as implement steering and control systems can easily be installed and set up in the field. 2. Innovative AMS technology is available to allow wireless communication between the equipment, the John Deere dealership and the farm, enabling remote support, proactive maintenance and fleet management. Whether remote connectivity is required or a high level of precision farming accuracy needs to be achieved, John Deere is able to provide a complete range of solutions, available from a single source and fully integrated into the equipment. 3. 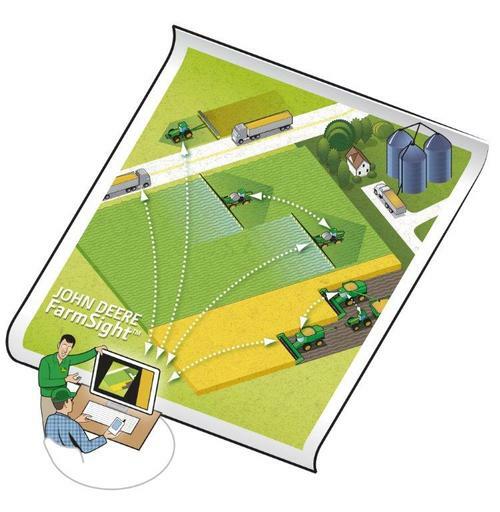 John Deere FarmSight Service Packages from the local John Deere dealership can add significant value to the farm business, be it through machine and logistics optimisation, or by supporting agricultural decision making. As an example, JDLink reports and customer recommendations are available to analyse machine utilisation, uptime hours and average engine load. This enables the dealer to suggest that the customer should keep an eye on idle machine time, consider increased use of guidance systems and eventually adopt a more fuel efficient driving habit. Changes to these three areas alone can help to significantly reduce operating costs. With John Deere’s Remote Display Access (RDA), the dealer can remotely view the GreenStar 3 2630 display in the cab and advise the operator how to correct tractor and implement settings. The dealer can also carry out operator training, even with third parties involved. This wireless connectivity between the operator in the field and the dealer results in significant time savings and leads to increased machine uptime. MyJohnDeere.com has been designed to serve as a central web portal for customers, so they can access a variety of machinery and business relevant applications to help them in their daily decision making. A single login leads to the various John Deere apps, such as JDLink and StellarSupport. MyJohnDeere.com also includes a new Operations Centre app, which provides a quick overview of any equipment’s current location and the work progress of individual machines on a map. A new Data and Account Management system has also been developed within MyJohnDeere.com, to ensure secure data handling and protection. Accounts are set up so that only the customer controls data access.